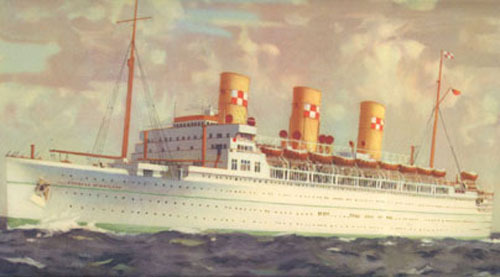 Canadian Pacific's Empress of Scotland epitomised luxury liners of the golden era of passenger shipping, the 1930s to 1950s. After a decade of trans-Pacific voyages as Empress of Japan, she served with distinction in World War II as a troop carrier. This was followed by transatlantic and cruising service. These pages tell the story of this distinguished ship with the help of photographs, press cuttings, and other contemporary material. Author : P J Sharp. Optimised for 1024x768 screen resolution, Internet Explorer v.5.0+, Large Font (120dpi), & True Color. This is a non-commercial website, for education, information, & research purposes only, and has no connection with any commercial enterprise. Copyright © 2003-14 P J Sharp. All rights reserved. In the event of any copyright concerns please contact us at the e-mail address below. Where it has not been possible to establish copyright we hope that the author will forgive us and we will of course remove any material on request.